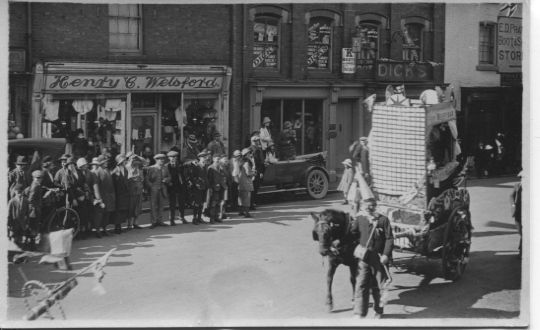 Procession passing Henry C Welsford’s shop c1930. Henry Clarke Welsford, Fancy Draper of 9 Cross Street, Ellesmere in 1922 Kellys Directory. His private residence was Lloran House, Ellesmere. He married Rose Philips in Brighton 18th April 1917 and he died 14 May 1962 aged 95. On 1881 census he is resident in Llangollen.